Pork tenderloin was on sale a couple weeks ago, so we had it in the freezer. I recently moved some of the cookbooks that were remaining at my condo (that I just sold) to the house, and was flipping through Stefano Faita's cookbook and I happened across a pork souvlaki recipe. That sounded like the perfect way to enjoy the tenderloin we bought! Side note: Stefano Faita's cookbook is full of awesome (and easy) recipes, so I suggest checking it out. Don't forget that your local library has cookbooks! In a small bowl, combine olive oil, oregano, garlic, lemon zest, lemon juice, and black pepper. Slice pork tenderloin into cubes, and place in a large bowl. Pour olive oil mixture over pork, and toss to coat. Cover bowl with plastic wrap and marinate in the fridge for 1 to 2 hours. Place bamboo skewers in water and allow to soak for at least 30 minutes. Remove skewers from water, and put 6 cubes of marinated pork on each. Grill for 5 to 6 minutes on each side, until browned. 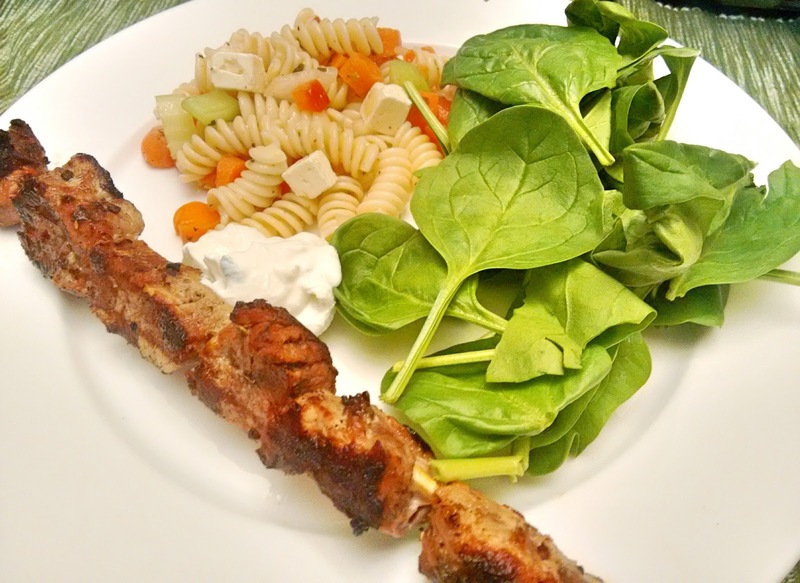 Serve souvlaki with tzatziki for dipping.